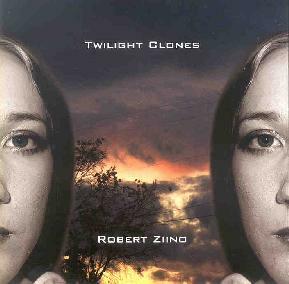 Robert Ziino - "Twilight Clones"
Electronic anarchy seems to be fashionable in this present age of electronic music’s expansion from a purely academic exercise into an increasingly ordinary component of popular culture. So it should come as no surprise that Twilight Clones’ aggressive synthetic textures and transwarp rhythms instantly remind one of similar projects by Aphex Twin, Photek, and other beat-n-loop practitioners of electro-drone narcosis therapy. Very little information is given about Ziino and his co-conspirators on the sleeve, which is probably just as well since the egregious sounds that emanate from this album could’ve easily been programmed, recorded and mixed by Hal 9000 on the Discovery’s year long voyage to Jupiter. No wonder most of the crew went into cryogenic hypersleep — I would’ve too if I’d known DJ Hal was going to be spinning this disc all the way to the Red Giant. The problem with Twilight Clones is easily discernible: Ziino apparently has neither the ability nor the desire to explore any consistent melodic or harmonic elements of sound construction. What we’re treated to instead on Twilight Clones is a series of atonal burps and farts electronically processed into an assemblage that only superficially resembles music composition. As a result, Twilight Clones is essentially non-music for hopeless cybernerds and unrepentant technocrats. No doubt that’s precisely Ziino’s agenda. However, even the best music concrete mixers — from Varese and Stockhausen to present-day acolytes such as Ron Geesin and Tod Dockstader — can attest to the fact that noise for noise’s sake can only result in a very noisy mistake. Ziino’s sound collages might actually merit some attention if one were on a steady diet of psilocybin, but otherwise the electronic noisefest he’s burned to disc on Twilight Clones will probably necessitate only an overdose of extra strength Tylenol. For more information you can visit: http://www.experimentalartists.com.